I am not so sure whether a miserable, damp, grey Easter Saturday is a good day to hold our meeting or not. However, as always, the atmosphere in the hall was as warm and busy as ever. I personally thought this to be an excellent meeting since we had a good variety of new models present and overall their general standard of presentation and quality of construction was very good. Also, I managed to get a good look at most before it was time for me to leave. So, after many conversations with acquaintances old and new I went home with enough material to write this report. However, it would help considerably if every model was labelled with the builders name and I would appreciate more short model descriptions as this enables me to keep things relevant. My thanks to those who did provide me with some written material and, as ever, my apologies to those I have missed or misrepresented in some way. On this occasion my model tour started with our Chairman George Illingworth who showed two of his (many) fire engine models. 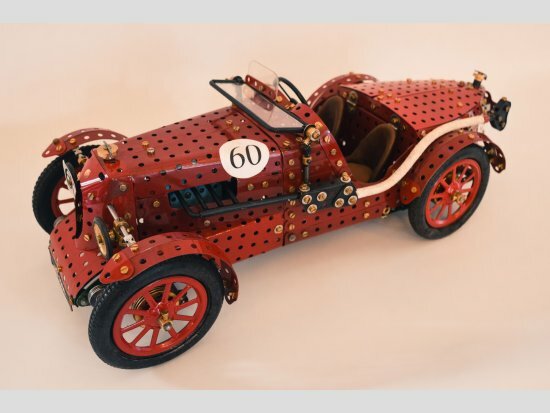 The first was based on the Ford AA motor pump dating from 1935 and made imaginative use of red, zinc and gold coloured parts. The second rather larger model was based on the 1970s Thornycroft Nubian airfield crash tender which was constructed mainly using yellow and zinc coloured parts. 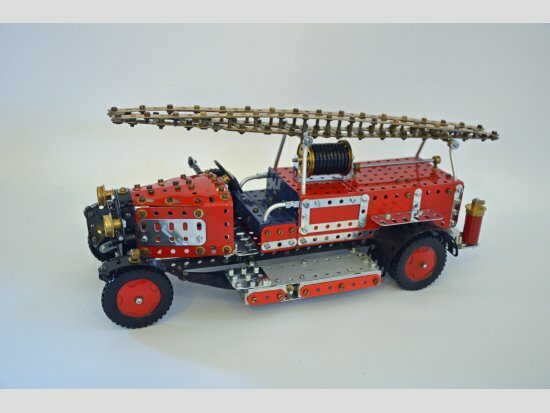 Both models were built to approximately 1:12 scale and represent a small part of George’s collection of 49 fire engine models, so far! Alongside, our Secretary Roger Marriott who brought along a pair of railway breakdown cranes. Both were built using correct period blue and gold parts, the smaller model from the 1937 outfit 5.11 instructions and the larger model built by Roy Whitehouse in restored parts from SML 30, and purchased by Roger in Roy’s recent sale. 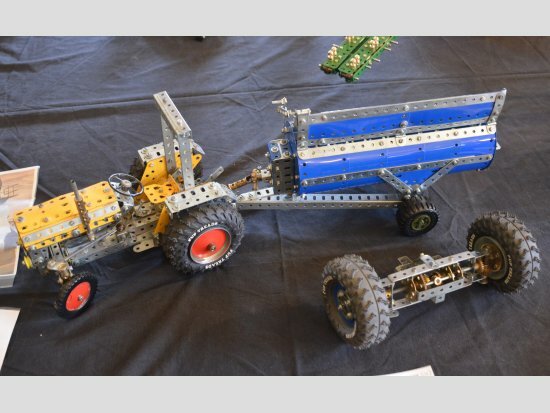 It is interesting to see how Meccano really made the best of a successful model design and this particular prototype may be found in the instruction manuals of many outfits in addition to the pair shown here. I was pleased to see Charles Catt, a member of MMG since the beginning of time but, as far as I can recall, this is the first time I have seen Charles or one of his models for over 20 years! The model he brought along was built from a small modern French outfit – the Mountain Rallye 25 rally car. This small model measured about 12in long and comprised mainly black parts with some features picked out in “dayglo” green. Quite an attractive little model. Michael Bent also decided to join the fire brigade for this meeting and brought along his fire engine model built from the 1938 No.8 outfit instructions, also nicely modelled in the correct period blue and gold colour scheme. Next, Richard Payn brought along his substantial model of the Jones KL66 mobile crane built mainly in yellow and dark blue coloured parts from MP101. The original model design is attributed to the late Hugh Henry, rebuilt by Mike Edkins and written up for the model plan by Tony Brown. Richard’s model was a trial run for a revised version with some improved mechanical detail. 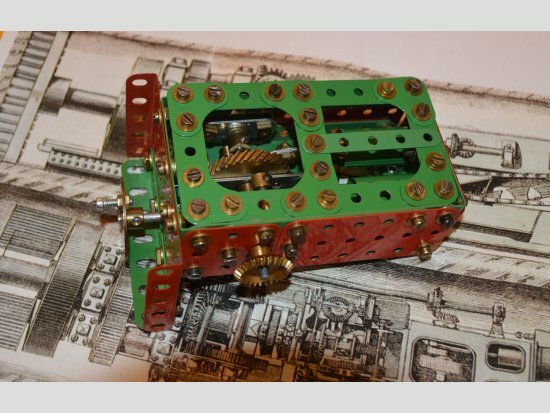 I was also most interested to see some mechanical constructions built by the late Rod Rich who had a reputation for manufacturing his own “Meccano” parts, in particular black anodised structural parts and a wide variety of non-standard brass gears. Mei Jones brought along a collection of smaller models, being favourites from his more youthful days - a trip down memory lane as he put it. All of the models were well made using pristine parts to make a very nice presentation. 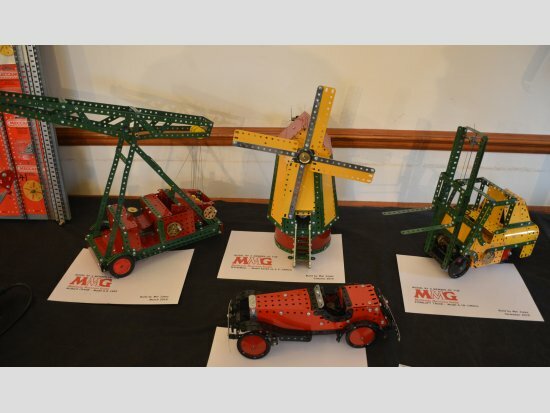 The collection of models included a mobile crane from 1953 No.6 outfit instructions, the fork lift truck model No.6.18 of 1954, the windmill model No.6.3 of 1954 and the sports car from the 1953 No.4 outfit instruction manual. 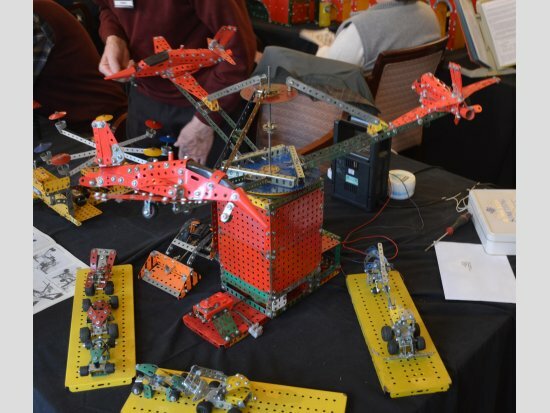 As always Tom and Matthew McCallum brought along some extremely rare items from their extensive Meccano collection. These interesting items comprised a 1913 windmill outfit together with the little windmill made up using the correct nickel plated parts, an early Scientific Series outfit and a prototype 000A outfit, the latter is believed to be a one off dating from about 1930. Tom and Matthew also brought along a mechanical man constructed using mainly red and green parts, but I failed to establish his pedigree! Nearby Pete Evans was showing off his very nice model of the 1931 MG Ex120 C type Montlhery Midget sports car. The model is about 15in long, very carefully put together using red parts and with a fair amount of attention to detail – altogether a very nice job. 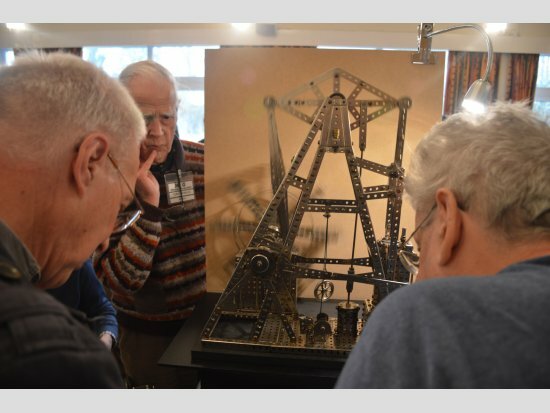 Pete also succeeded in confusing the cognoscenti by bringing along his substantial model of a Ruston Bucyrus Erie 150 excavating machine and failing to put his name on it! This too is a very nice model but was temporarily out of action at the meeting. Moving on I came to a pair of small neat models built by Neil Bedford, firstly a yellow lorry crane built from a modern Meccano Evolution outfit and secondly, at a similar scale, a model of the AEC Matador chassis, mounting a Coles crane and painted overall in RAF blue to represent WWII RAF issue. Now for something rather different; Meccano models of musical instruments have not been “top of the pops” in the past for obvious reasons. However, Richard Smith is about to change all that with his full scale 12 string acoustic guitar, and what we saw at the meeting was the not quite finished instrument. He hopes that in due course it will be playable, but I fear that might just be wishful thinking as it takes most of a No.10 outfit to construct and only the very strongest of musicians will be able to lift it! Listen out for it at the next meeting and we might just be impressed. 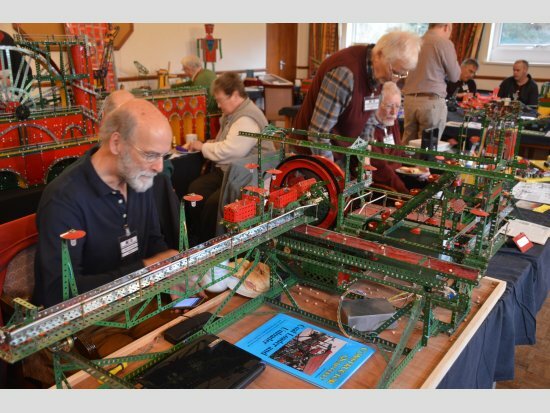 Greg Worwood is a relatively new member of MMG but already he has made his presence felt by bringing along his very large models. At this meeting his chosen subject was the Land Rover Defender vehicle to commemorate its recent passing, having been in continuous production since 1948. The model was fitted with suitably authentic large diameter wheels and tyres. At approximately one quarter scale this is a big model measuring about 40in long. Greg also brought along his very own authentic “Blue Plaque” - a present from his niece in thanks for his officiating at her wedding ! Nearby was a rather smaller model by Terry Wilkes – a Massey Ferguson tractor together with its rotary muck spreading attachment. Both items were very nicely constructed to include some realistic mechanical detail, and coupled up ready for action measured about 20in over all. Alongside I found some alternative system models built by David Hobson. 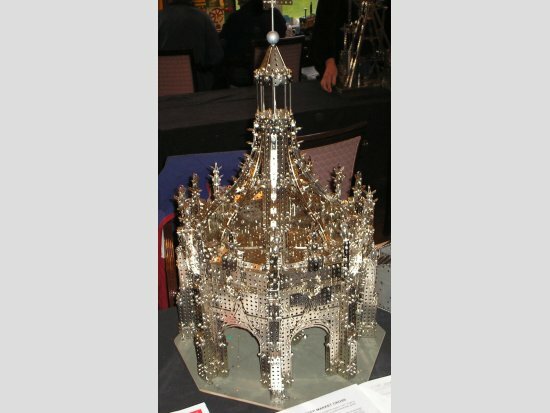 First was a superb model of the Chichester market cross modelled entirely in zinc plated parts from the modern Eitech construction system. The model embraced a considerable amount of structural detail and measured about 12in wide and about 18in high. 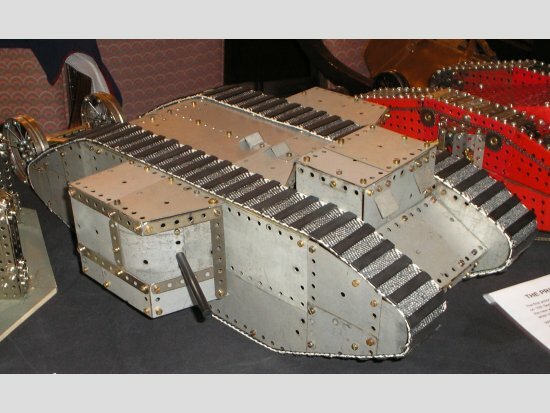 David’s next model was a 1916 WW1 tank made from an earlier Primus system outfit – model No.362. The model looked very good since the tracks were effectively modelled using fabric strips with short “gripper rods” attached transversely every 1½in, or so, along the track fabric. 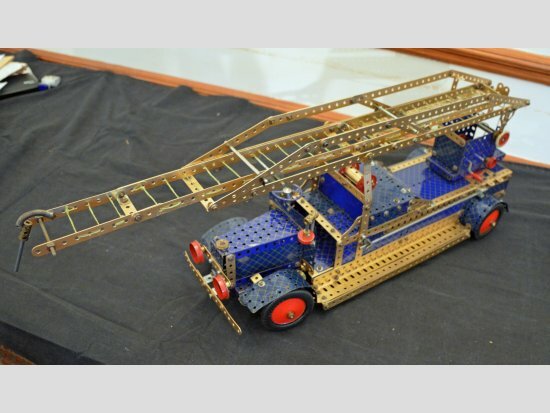 Not to be outdone, Meccano produced a special model No.403 in 1917 to a similar scale and David also brought along this model for comparison. Interesting to see two rivals together and in my opinion I think the Primus model is the better looking of the two. Our other specialist collector of alternative construction systems, Tony Knowles, brought along a very nice model of a riverboat engine assembled entirely in the nickel plated parts from an American Model Builder (AMB) outfit. 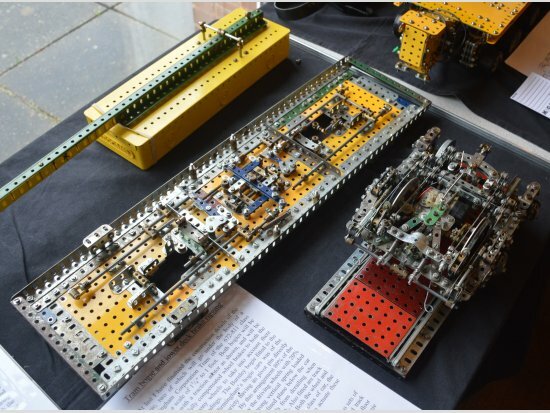 The AMB system was introduced in 1912, it was more or less a direct copy of Meccano and was its first serious competitor. Production of AMB ceased in 1921 after Hornby's lengthy but successful legal action for copyright infringement. 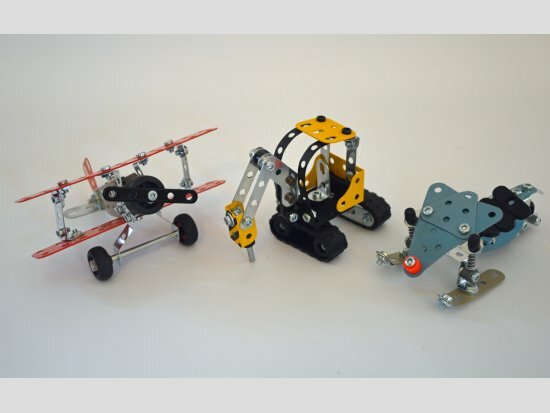 The initial range of 62 parts was similar to Meccano, with the addition of sprockets, a rack strip and eccentric wheel. All relevant parts had bosses tapped 6/32 which, curiously, was smaller than the 5/32 thread of the nuts and bolts. By 1914 the range of parts had grown to include electric motors, gears, spoked wheels and other familiar small parts. Seven AMB outfits were produced, all included an electric motor and the largest was bigger than the largest No.6 Meccano outfit of the time. The model is of an early riverboat engine developed in America in the 1820s. Although they were regarded as being rather crude they were very successful and remained in use into the 20th century. The main structural parts were originally wooden but by the end of their long life some of these were replaced with metal parts. The early valve gear was also improved to include two eccentrics to give better engine control. Then it was back to some more traditional offerings, starting with a very nice model of the AEC Ranger touring coach of 1935~1936 vintage constructed by Brian Edwards. Obvious features of this model include the sunshine folding roof and the effective attempt by Brian to use red and yellow parts to reproduce the livery of Westcliffon-Sea Motor Services. The model measures about 20in long and about 6in wide. 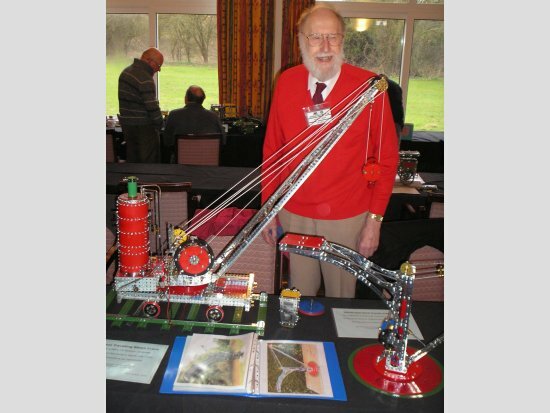 Moving on to Ken Senar who brought along a pair of model cranes derived from his visits to Blists Hill Museum at Ironbridge. 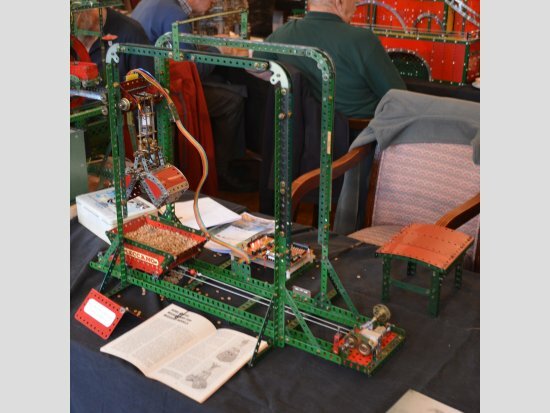 The first model was an accurate version of a Grafton 5 ton travelling steam crane. Superbly well made to a scale of about 1:10, all the mechanical functions of the crane are correctly reproduced and it looks splendid in its red and zinc colour scheme. 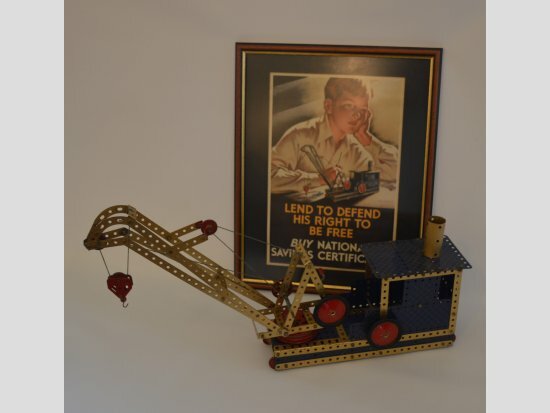 Ken’s second model was a much more modest affair – a hand operated canal side crane, which was also reproduced with the care and precision that we associate with this modeller. It is well known that John Palmer likes to make smallish models of every day road vehicles, so it came as no surprise to see the two new models he brought to the meeting. The first was a typical breakdown truck, built in his familiar style, to his own design and resplendent in blue and zinc colours. 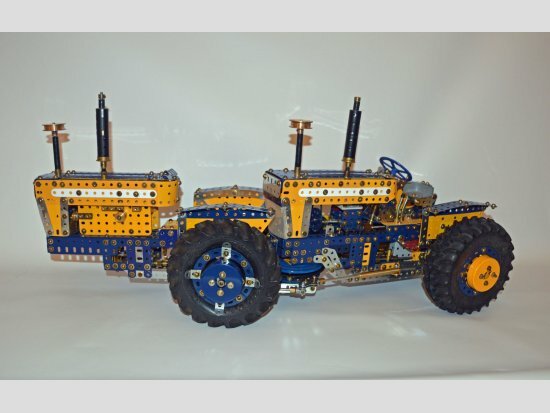 His second model of an articulated vehicle with a long low loader trailer and also featured a blue and zinc colour scheme, but was built to a smaller scale. So both models were of a similar size each measuring about 12in long. Equally well known is Dave Bradley’s preference for radio controlled models of VW vehicles built to a substantial size. Dave brought a model to this meeting that I have not seen before, namely a VW T26 pick-up truck with a matching two axle trailer. 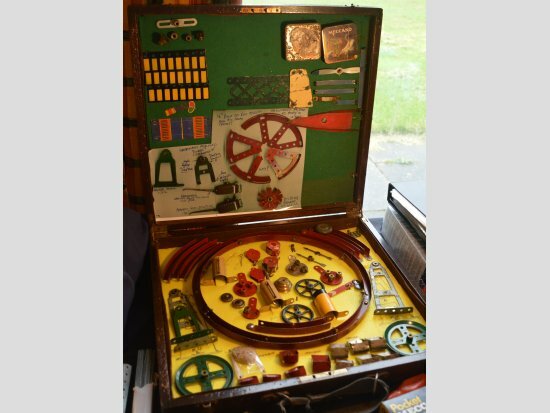 Presumably this model is representative of the kind of kit the chaps who mend pot holes might use since Dave had furnished the trailer with an assortment of tools appropriate for that task. Built using mainly yellow and zinc parts, incorporating the usual RC control gear and measuring up at about 30in long by about 12in wide. 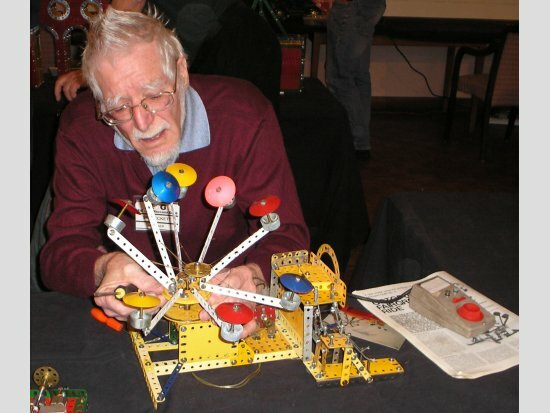 Jim Gamble is probably best known as the pre-eminent Meccano collector and historian and usually brings some interesting items to the meetings. 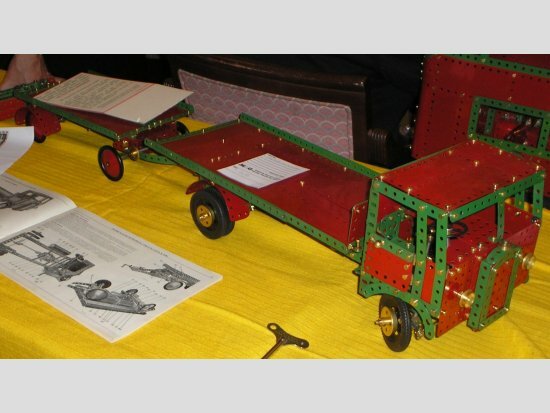 This time his “exhibit” was rather more topical than usual – the flat bed truck and trailer built from the 1949 No.9 outfit instructions in the correct mid red and green colour scheme. The important point of interest is that the model was constructed by that scruffy TV “celebrity” James May in his very public bid to recapture his youth. I guess we can all identify with that worthy aspiration! 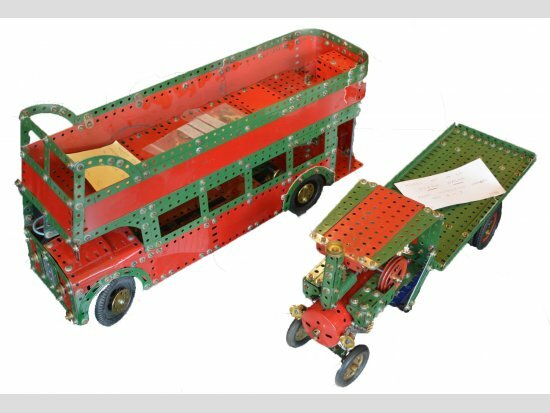 Coincidentally, the next model I came to was Geoff Wright’s new Routemaster London bus, also constructed from a 1950s No.9 outfit. In 2008 Boris Johnson promised a new Routemaster bus for London, to replace the single deck articulated 'Bendy Buses' if he was elected mayor. One feature he was most keen to incorporate was the open rear platform. Duly elected, his pledge was developed into a bus no less than four years into his time as mayor. The new bus is most attractive and is distinctly different from the traditional rather box like designs. 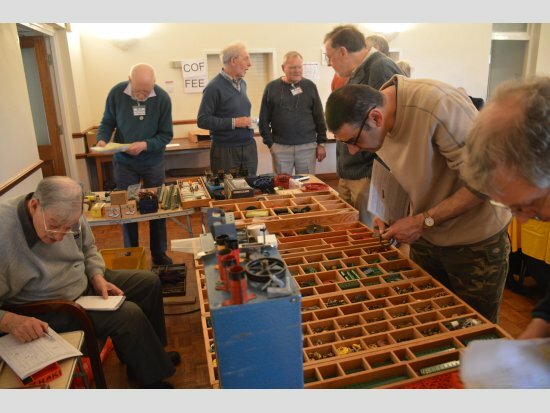 Geoff has designed and built the model to a scale of 1:14 so as to use 2" Pulleys and tyres, similar to his 'Interstation C' Leyland Cub model, which was also present at the meeting. Like all of his recent projects the model is limited to the contents of a mid fifties' red and green No. 9 outfit. The outfit does not incorporate sufficient parts to model much of the interior, especially the upper deck floor. However, the remaining parts will be used to incorporate further detail in due course. 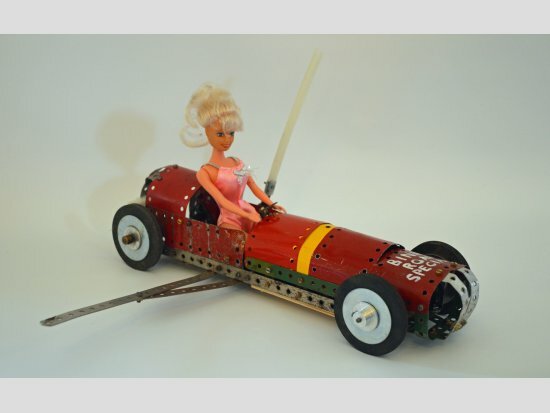 George Sayell is also a tethered model car racing enthusiast and has built an experimental working Meccano car – the “Binns Road Special”. He explained that tethered model car racing was a popular sport in this country from just after WW2 until the 1960s. The model runs around in a circle tethered to a central pole and is timed over a set number of laps. Traditionally model cars are made from wood and metal and are powered by an internal combustion engine but there is now interest in the use of electric power. 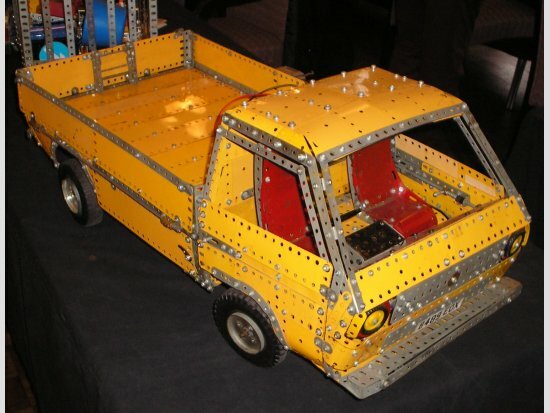 The 'Binns Road Special' is a prototype using a model boat motor, battery and redundant Meccano parts. George also brought along a mobile crane built from instructions in MM for October 1954 and a sports car built from the modern 7700N outfit. 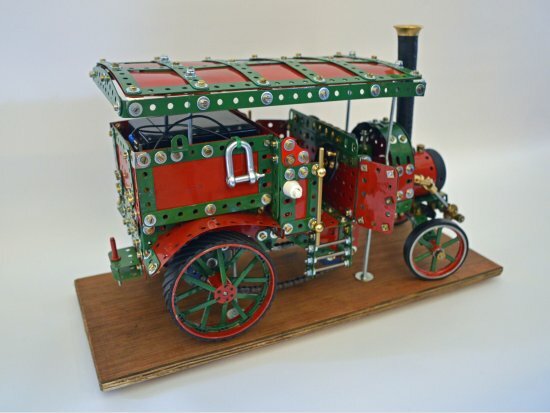 Next, I came to a familiar looking model built by Dave Phillips – a Robey Express Steam Tractor. Dave’s models are usually built to a “comfortable” scale, giving the model a length of about 15in, they are mounted on a baseboard for display and notably, they are built from restored parts painted red and green. The quality of the restoration and construction is excellent and Dave’s models make for a very attractive presentation. A great introduction for James and I hope we will see more of him and his models in the future. New member Carl Gill got off to a good start with MMG by bringing two examples of his accomplished model building skills. 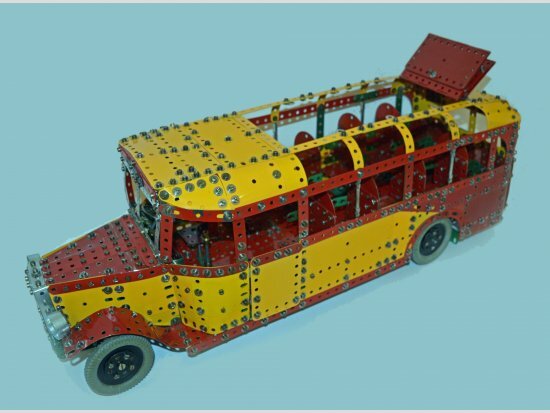 Firstly, a double deck bus equipped with the Meccano infra-red controller for remote operation. To give you some idea of size, the bus measured about 15in long by about 5½in wide. 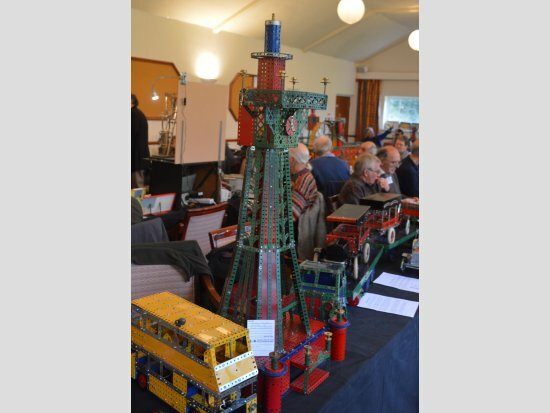 Carl’s second model was a substantial interpretation of the Blackpool tower, built in mid red and green colours it stood about 3ft high. It looked like a typical dealers display model to me, but I failed to obtain any further information about the model. John Bland also brought along a model of a bus to a similar scale and size. 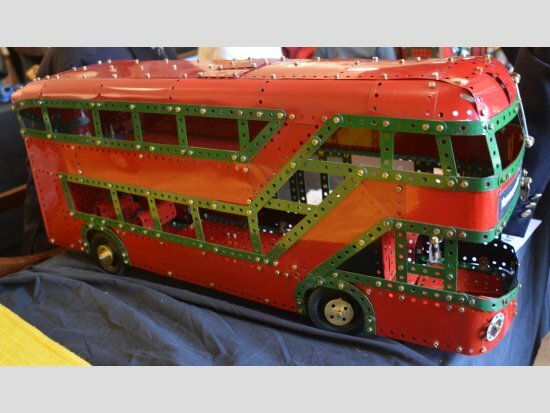 However, John’s model was of an open topped touring bus, very nicely constructed in mid red and green parts. John also brought along a steam wagon, but when I saw it, it was lying on its back whilst the internal works were receiving attention. Next door Tony Brown was showing off several large trucks of some historical interest. 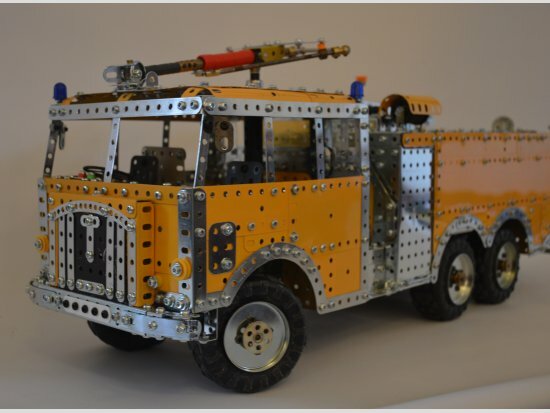 The flat bed Transport Lorry and Trailer were built from the pre-war No.10 Meccano outfit instructions. It is an attractive model which is impressively large, at about 6ft long, but mechanically it is something of a let down, being underpowered with a weak and not particularly effective clutch. 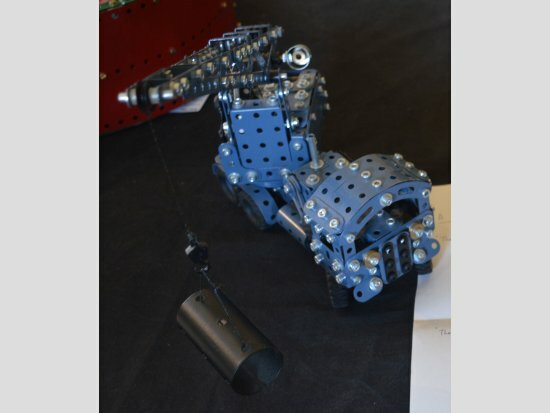 Also, it is almost impossible to access the motor once the model is complete making it difficult to operate. It is evident that this model incorporates an unusual combination of coloured parts and one which would probably not have been seen in this country. The combination of green strips with blue and gold flexible plates was the export colour scheme used for certain countries within the Empire and South America at the time. Tony is currently restoring this outfit which dates from around May 1940 and should have gone to South America. However, presumably because of the export restrictions applying at the time, the set was never delivered and remained in this country. Tony’s other trucks were Gilbert Erector "White" Trucks so called after the company which manufactured the prototypes. Gilbert Erector introduced these models in the late 1920s and they remained in the range for several years. Two of the models are based on instructions in the 1927 manual and one of the two sets used is one which was marketed in the UK in the early 1930s. A number of special parts were included to improve the fidelity of the models. The third truck was built from one of the last outfits to contain any of these special parts, a simple bonnet and radiator pressing in particular, and is an outfit from the early 1950s for the Danish market. 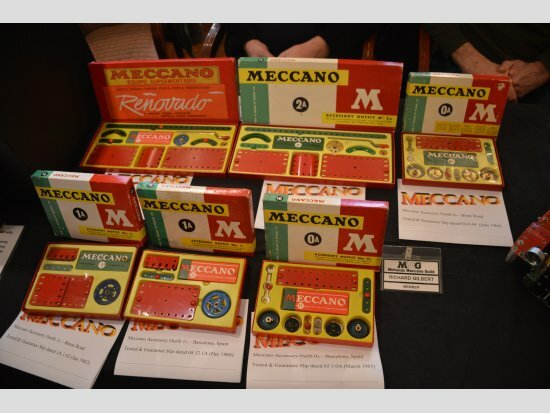 Another of our collectors, Richard Gilbert, brought along some small 1960s Meccano accessory outfits. For the purpose of comparison, the outfits on display included No’s. 0A, 1A and 2A as manufactured for the UK market, and No’s. 0A, 1A and 2A as manufactured for the Spanish market. Together they made a very colourful display with plenty of opportunity for the eagle eyed to spot the differences. Terry Pettitt brought along his latest model of a Fowler/Field Marshal Tractor which was a tracked version of the more common wheeled model. I am indebted to Terry for the following description of his model. The tractor was powered by a single cylinder two stroke engine of 6" bore by 9" stroke installed such that the cylinder was mounted longitudinally at the front of the frame with the crankshaft and transmission shafts mounted across the frame behind the engine. Steering was by means of brakes on the differential output shafts. 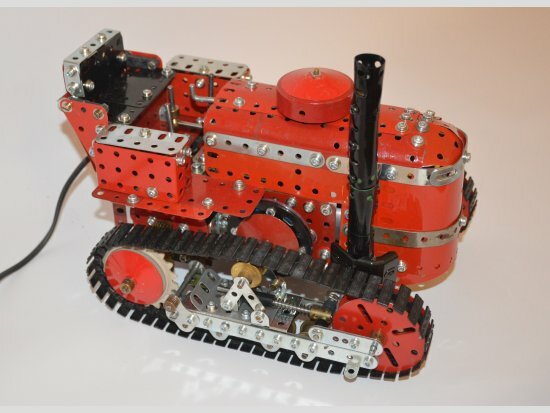 The model follows the original as closely as possible and uses standard Meccano plastic tracks. A non Meccano motor is fitted at the front of the frame in the position occupied by the cylinder on the prototype but a powerdrive motor could probably be used. The motor drives the flywheel shaft by means of a contrate gear. A complex gearbox arrangement is driven from the flywheel shaft to give three forward speeds and reverse, followed by a high and low ratio drive to the tracks. The differential output shafts are fitted with hand operated brakes and at the outer ends a 25t pinion engages a 60t gear attached to the track drive sprockets. Track suspension was by torsion bars but a transverse leaf spring is used on the model. The plastic tracks work well and can produce a substantial pull, their main drawback is that they are rather too narrow. After the last meeting I reported on a version of Brian Compton’s Coal Loader constructed by Paul Merrick. At that time Paul was having a number of problems with the electro-mechanical functions of the machine. I am now pleased to report that he has resolved the difficulties and the machine was working perfectly when I saw it at work. Alongside was yet another example of Brian Compton’s wizardry in the form of an electro mechanical device which beavers away and achieves nothing! The machine comprises a crane grab suspended from a gantry and a small truck on rails below the gantry. 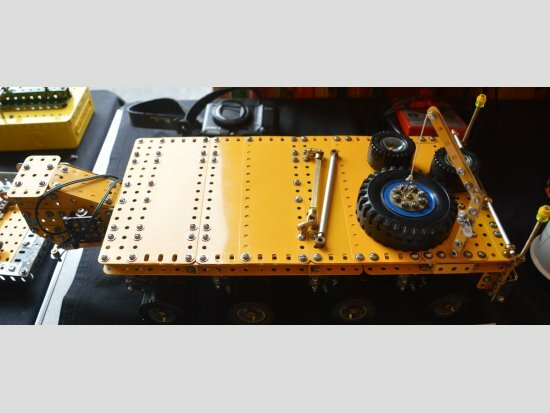 The truck and grab bogie can move from side to side under the control of some programmable electronics. In operation with the grab and truck at one side of the machine, the grab takes a mouthful of dried lentils from the truck, both the grab and truck then move to the other side of the machine when the grab puts the lentils back in the truck. A very good demonstration of the power of electronic controllers and also of an “exercise in futility!”. (I hope I got this description right.) It is worth taking the time to have a good look at this machine as it makes interesting use of the rack strip and rack segment parts. Paul Hubbard had acquired three of the small Red Arrows aircraft outfits and decided to create a display model to show them off. His model comprised a powered turntable mounted on a raised base and the turntable carried three radial arms to carry each of the aircraft models at their extremities. 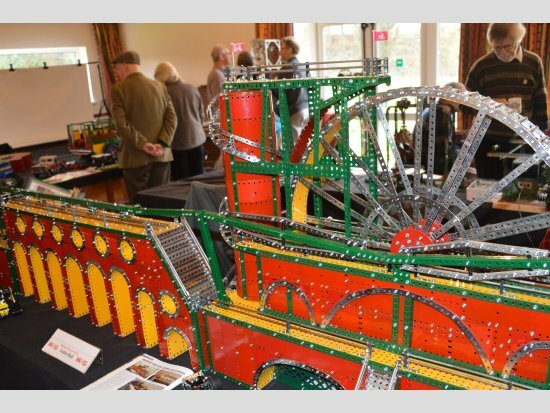 The overall effect was much in the style of a fairground ride and the display was seen operating for most of the time at the meeting. 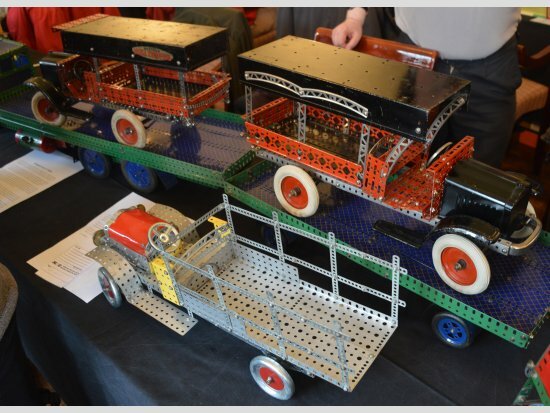 Paul also brought along a number of small models made up from the Meccano single model outfits. And finally, on this leg of my tour I came to Sid Beckett who brought along a typical example of his smaller child friendly models – an Octopus fairground ride. The original building instructions for this model were written by Dr Keith Cameron and published in MM in 1981. The model was designed within the scope of a No.4 outfit and the original ride had four arms with cars. Sid’s version is a development of the basic design to eight arms with cars, otherwise it all looks familiar. 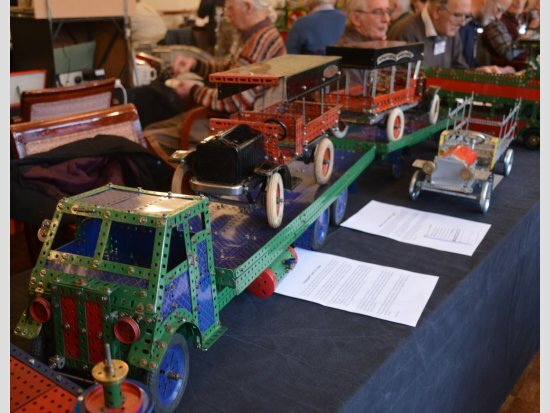 Mick Burgess brought along a very colourful display of small road vehicles built from 1950s/60s No.4 and No.7 outfits. 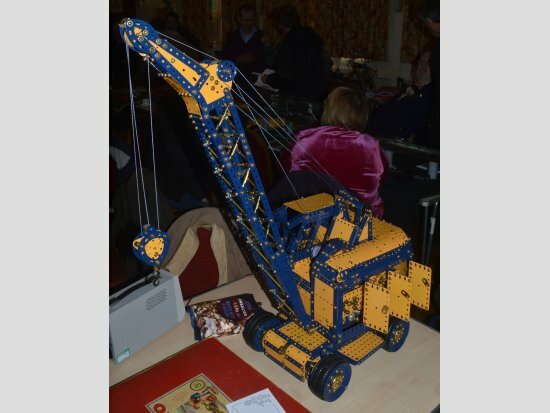 The Jumbo mobile crane in blue, yellow and zinc was built from instructions in the July 1985 Airfix magazine. An outfit No.4 model, it has recently been confirmed as an original Bert Love design. The light red and green Streamlined Sports Car, nominally model 4.11 (1962-69), was modified to improve the match between the front end and the rear end. The second light red and green Sports Car was built from outfit instructions 4.15 (1962-69). The mid red and green Saloon Car was built from instructions published in MM for April 1948. The model is powered by a Magic Motor and it is believed that it was probably developed to become model 4.35 in the 1954-61 instruction manual for outfit No.4. 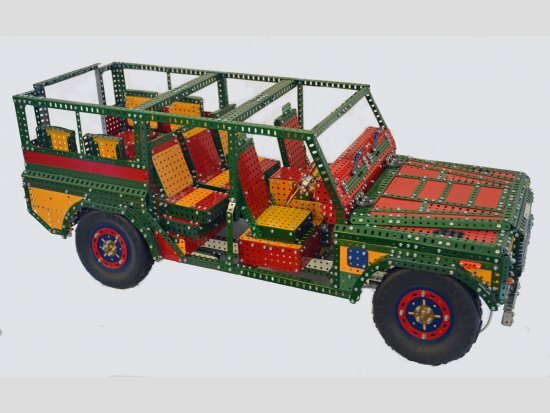 Mick’s last model was the Land Rover with trailer, constructed in mid red and green parts from instructions in MM for June 1955. The model is a little underpowered with a No.1 clockwork motor under the bonnet, so Mick incorporated a Magic Motor into the trailer as well. The other modification was to fit the trailer with 2in pulleys with rubber tyres to improve traction and appearance. This model was probably the inspiration for the later outfit No.7 building instructions 7.10 for the Police Patrol Car which featured in the 1962-69 manuals. Tony Wakefield has built a number of models of cars in recent years. All to his own design and all measuring a manageable length of about 18in over all. 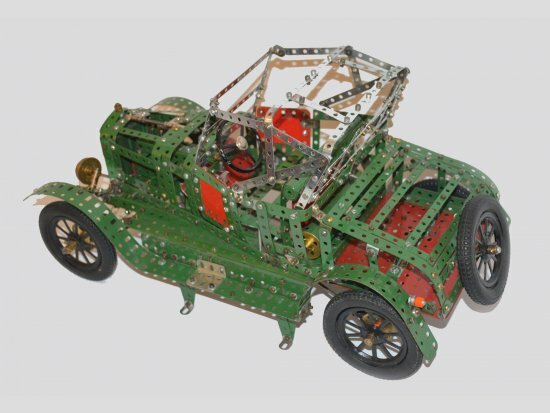 His latest model (see front cover) is a Ford Model T of 1926 vintage, it is built in a green and black colour scheme and, in his own inimitable way, the body work is represented by a skeleton structure in order to reveal the internal detail. As is often the case, the scale is set by the wheels and these comprise spoked wheels fitted with 3½in pulley tyres. 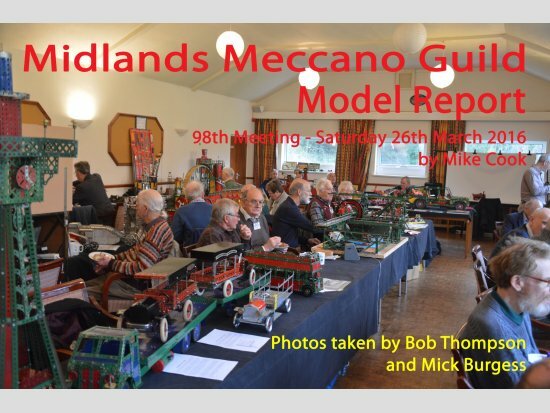 It has been quite a while since I last saw Mike Edkins, so it was good to catch up with him again, especially as he brought some models to the meeting. Firstly, Mike brought along a bogie and the lower deck brake rigging for his Birmingham Corporation 672-811 class tram built to an approximate scale of 1:11. This model has been in construction for some considerable time, so it was interesting to see some progress. Two bogies will go under the body of the tram and both bogies are equipped with a traction motor and fitted with fully compensated wheel brakes to both the driving and pony wheels to take into account the different axle loadings. The Burnley bogie is of the maximum traction variety having its pivot pin directly above the driving axle. By this arrangement 80% of the weight is carried by the driving wheels and 20% by the pony wheels. Each bogie is also fitted with track brakes and dummy magnetic rakes. 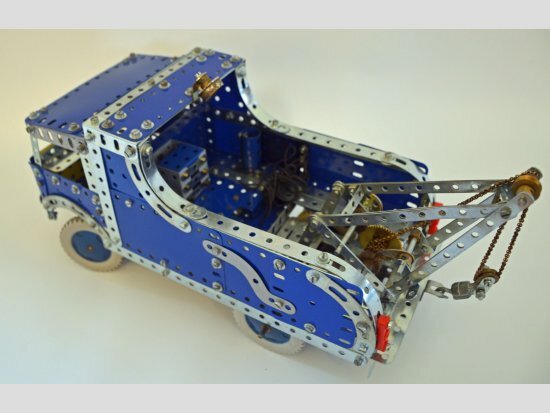 Both the wheel and track brakes were air operated in this class of car; the model will use electric servo motors to actuate these braking systems. The two sets of brake rigging needed to actuate the wheel and track brakes are installed below the lower deck floor. Each pull rod is taken to the centre of the floor and split via an equalising lever so that each bogie receives the same amount of applied braking force. And there will be more to come on this very complex model. Ever heard of a Diddley Bow? Well, Mike’s second model was an example of this primitive stringed instrument. Sometimes known as a cigar box guitar, it is a one string musical instrument. They were popular with African Americans in the southern states of America from about 1860 onwards. Most were constructed from a broom handle and cigar box, the latter acting as a resonator to amplify the sound produced. A length of fencing wire, later a guitar string, was attached to the ends of the broom handle with the string passing over a raised bridge on top of the cigar box. It was played by plucking the string whilst sliding a bottle neck along it to produce the distinctive wailing sounds associated with blues music. It was primarily a percussion instrument for accompanying songs, but was also capable of playing a melody. 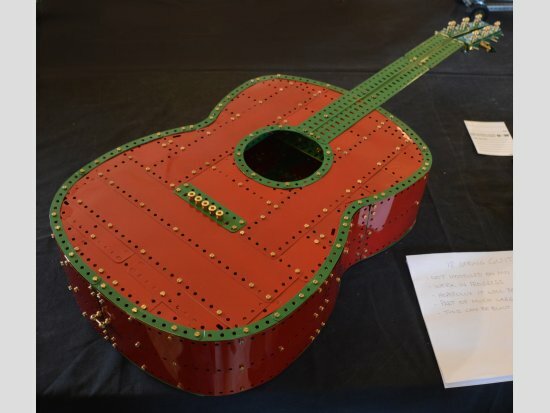 The only non Meccano parts used in construction of the model are M4 Metric washers and a guitar string. Those in the know will be aware that John Hornsby is building a 1:16 scale Gottwald heavy lift crane. This is a very large piece of kit at any scale and at the last meeting he produced several lifting blocks, which were quite massive, without giving too much away about the ultimate size of the model. At this meeting he brought an example of a four axle dolly, being the rear supporting carriage on which the crane stands and with which it is manoeuvred. This item was also quite manageable in size, but it is only one of many components of the crane. It also includes some clever mechanics to facilitate moving the crane. Assuming that John does not run out of nuts and bolts in the interim we will eventually be up for a “Big“ surprise when he brings the finished crane to our meeting, but this may be some time away. 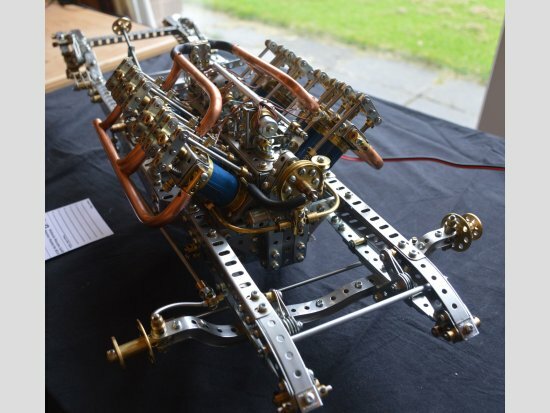 After the last meeting I reported on a superb model of a 1920s/30s V8 aero engine built from first principles by Terry Allen. Information provided at that meeting explained that the engine is destined for a 1914 Piccard racing car. At this meeting the engine was shown fixed to the racing car chassis although still lacking wheels and transmission. Bearing in mind Terry’s superb Bugatti, this new model is definitely not to be missed as it progresses to completion. 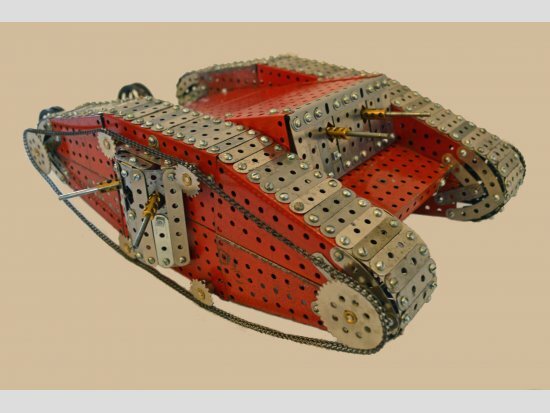 Then I came to Colin Reid who always brings along a collection of Meccano related artefacts that had inevitably been acquired at enviable cost in sales that only he seems to know about. 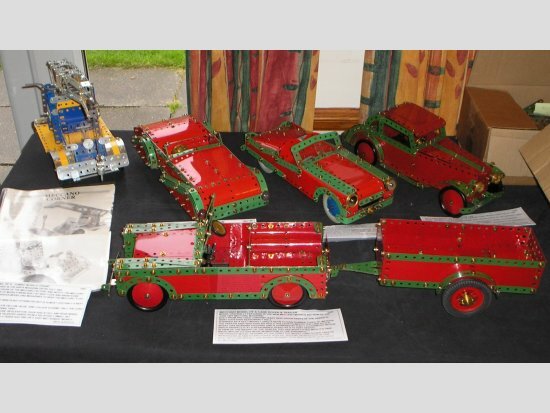 The collection on this occasion included a medium sized display case containing some rare Meccano items, in particular, not one but three K-type oil cans. The case also contained some “genetically modified parts”, in Colin’s words and which I would call mutilated! For example, a hub disc cut into four parts and a fan and lineshaft standard with bored out bosses. 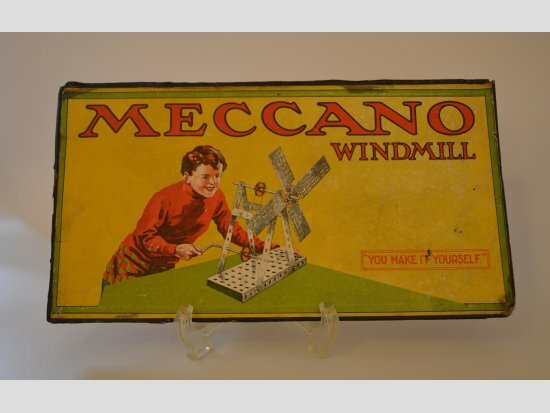 Other modern Meccano items included a radio controlled car a space vehicle, some mint New Cavendish books and other ephemera. Lastly, to conclude my model tour I found myself looking at two grandfather size clocks. 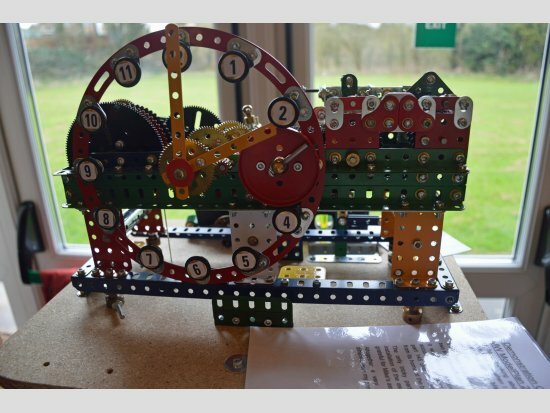 John Reid had been considering building a clock for some time and was sufficiently inspired by the Demonstration Clock Movement designed by Mike Edkins to get cracking. Instructions for building the clock have been published as MP221. The model has been built more or less to the instructions with one or two small modifications. The only tricky part was the calibration and installation of the escapement anchors and John is grateful for Mike’s assistance with this. John reports that he enjoyed the different challenge and was pleased that, for the first time, he found a use for the circular strip, part No.145, which has never before seen the light of day! The second clock was built by Richard Howard, and was seen at the last meeting at an earlier stage of its development. 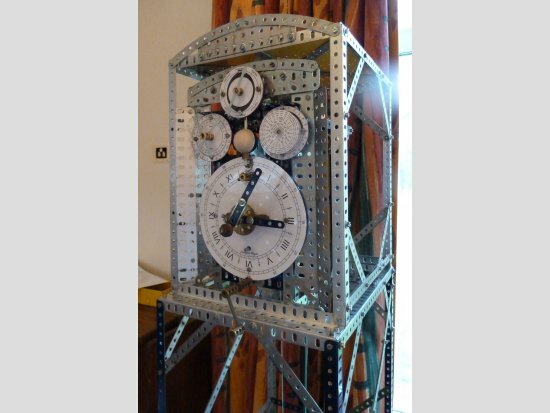 Richard’s clock was built from GMM instructions No.6 – an astronomical clock designed by Pat Briggs. Its authentic appearance indicated that it is now completed although I don’t know if it is in full running order. 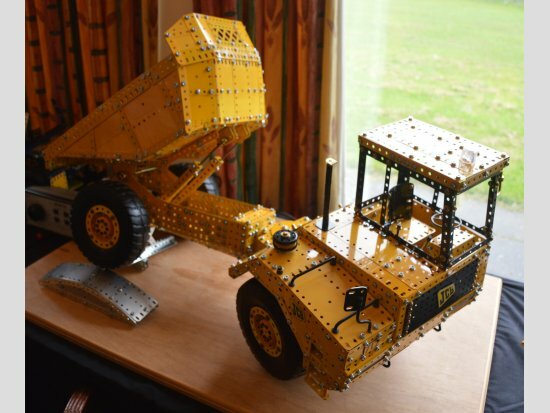 Visitor Ian Corlett brought along a large JCB 712 articulated dump truck built from the instructions in MP117. The model was designed by Tony James, with a scale of 1:8 such that it can be constructed from the contents of a No.10 outfit plus one or two extra parts. This is a big fully functional model being about 30in long over all. The model was carefully put together by Ian using predominantly yellow parts to give the model a very authentic appearance. The last model that I was made aware of was a bit of an enigma, called “work in progress” by its builder Howard Somerville. I have no idea what the model will eventually be, but I am sure that it will be a fine example of Howard’s craftsmanship. And that was it! Another excellent meeting with a large number of good quality models sufficient to please even the most critical of Meccano enthusiasts. As ever our resident trader was Mike Rhoades who seemed to be doing good business with the influx of new members who had the good sense to join MMG. Unfortunately John and Linda Thorpe were not present at the meeting as it was reported that John has not been too well. I wish John well and hope that we might see him fully recovered with Linda at the next meeting. I also noted with some personal concern that half a dozen, or so, well known names were conspicuous by their absence. I hope that this is a consequence of holding the meeting at Easter rather than ill health. I look forward to seeing a new crop of models at the next meeting and remember that if you wish to see your model reported in detail it helps if you provide a short write up for the reporter.